Life is busy and you need some time to revitalize and be with your family. Whether you are wanting peace and quiet with the tranquility coming from gazing over the beautiful Okanagan Lake or you want to energize yourself with sport and adventure our cottage, resort and surrounding area is the perfect place to vacation. The La Casa resort and surrounding areas offer various activities for the whole family. Everyone can enjoy the refreshing outdoor swimming pool, hot tub and private beach area. For those looking to play we have mini golf, volley ball, tennis courts and a well equipped play ground. Water sports, including jet skiing, water skiing, boating and fishing are all available. More of a land lover, well we are sure you will enjoy horseback riding, golfing, biking, ATV, skiing (during winter) and of course, the fantastic shopping available in Vernon, Kelowna and West Kelowna. There are local events and festivals running from May through to October, not to mention the amazing 14 wineries all within a 1/2 to 1 hours drive from the resort depending on location. Note: Full use of outdoor central amenities areas are weather dependent and full availability is from sometime in May to October. In addition, Fintry Provincial Park (located 5 minutes drive north of La Casa) offers further areas to explore (Fintry High Farm, water falls, trails, sandy beaches and a boat launch). There is also several ATV trails throughout the local areas. Our cottage is strategically located halfway between the beach/lake/marina and the amenities areas (pool, hot-tub, play-ground, tennis,& mini-golf). It is your cottage to enjoy. Take the time, because you and your family deserve it! Since building our cottage we have grown passionate about the La Casa Lakeside Cottage Resort and the Okanagan region. We frequently visit the area and continue to provide support for both the La Casa Strata Corporation (KAS2428) as well as rental management services. Best value for a cottage in the Okanagan region. With 3 bedrooms, 2 full bathrooms, and a sofa bed this cottage can accommodate 6 to 8 people. In addition, there is a full size deck with lake and mountain views, as well as patio furniture and a gas BBQ. 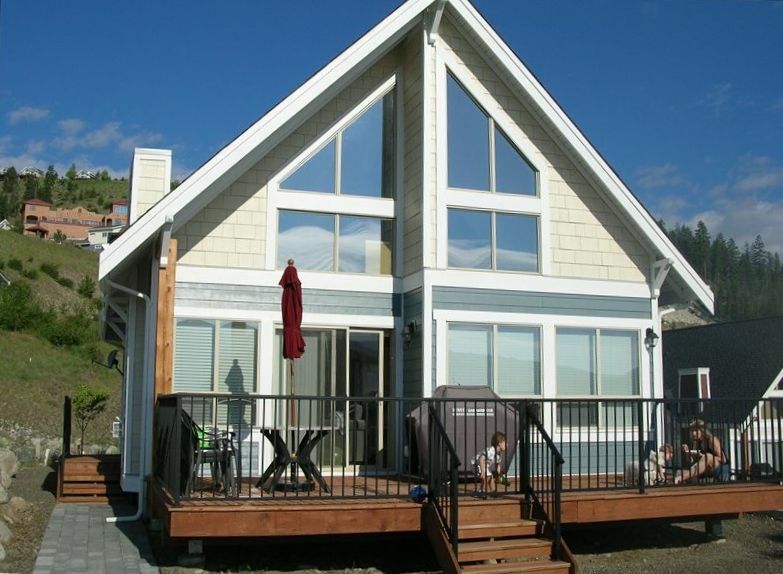 At a half hour drive north of West Kelowna, the La Casa Lakeside Cottage Resort offers a retreat from busy city life. In addition, visitors can experience a variety of wineries, restaurants and shopping in the newly developed commercial zone in the vibrant city of West Kelowna. Driveway can accommodate 2 to 3 vehicles. Additional overflow parking available throughout resort. Bring your own kayak or local rentals available. Bring your bicycle to enjoy numerous local roads and trails. Bring your own boat or local rentals available. Full size outdoor deck with lake and mountain views. Outdoor tennis courts located in central amenities area. There are (2) outdoor heated pools. One located in the central amenities area and a 2nd located in the upper level area of the resort. Excellent value as you get a fully equipped cottage (house) that feels like home! In addition, you are surrounded by amazing views of nature and the lake. Plenty of outdoor activities for all ages. Need to book early for summer season to ensure you get your desired dates. Will definitely return again-and-again to further explore the surrounding areas (Fintry Prov. Park was amazing as well) and try other lower cost seasons. Thanks for the positive review and comments. Everyone at La Casa looks forward to serving you again in the future. This property is located 20 minutes away from the main downtown area on a serene lake setting. It was exactly what we were looking for on our girls trip! In fact I sit on the deck watching the sun rise over the mountains/lake as I write this. It is nicely appointed with what you need to cook, sleep, wash up. We picked up food on our way in the first night. Each day we left to go do whatever we had planned (walk the Myra Canyon trestles, wine taste, Fintry Park, Bear Canyon Park) and then returned for an evening on the deck of reading and enjoying being on vacation! Robert was easy to reach prior to our arrival and answered any questions I had and provided a list of things to do in the area. I would definitely rent here again if I return to Kelowna. I know a previous renter complained about requirements of taking out trash and stripping beds, but I rent through VRBO and other sites rather than hotels on almost all my trips and these type of things are required by 99% of rentals. Nice place, amazing location , cozy . Amazing lake view ! But cleaning dishes , disposal of the garbage located hundreds meters away from the house and removing the linens after leaving is the responsibility of the guests so you know, otherwise the " extra charges " will apply . And it's all despite the cleaning fee that we paid. I think five hundred $ for two nights should have covered the cleaning. We are sorry that you were not pleased with your stay regarding the one time cleaning fee and check out requirements regarding removal of garbage, placement of used towels and linens into the bathtub and placement of used dishes into the dishwasher. This is the first time we have ever received a complaint like this since inception starting in year 2008. The one time cleaning fee is what we pay directly to the cleaning contractors between each guest stay. Guest requirements regarding guest check out procedures were outlined in advance via the Guest Checkout List that was sent via e-mail. All cottage rentals in the La Casa Lakeside Cottage Resort and elsewhere charge a separate cleaning fee. Cottage rentals do not typically operate like a motel or hotel were cleaning is included in the rental and this was clearly stated in the quote and your receipt. We trust this helps clarify matters. Home To Home Properties Ltd. This a great property. Suitable for children, pets and adults. It was wonderful to sit and have morning coffee on the patio deck with a view of the lake. Afternoons spent by the pool. The accommodations were perfect. A perfect place to relax. Option to explore back country wilderness with ATV or other type of vehicle (Ex. 4 x 4). Guests can bring their own ATV(s) or rent from local company (Fintry High Farms). In addition, there is a marina and boat launch for guests to bring their own watercraft or rent from local company.